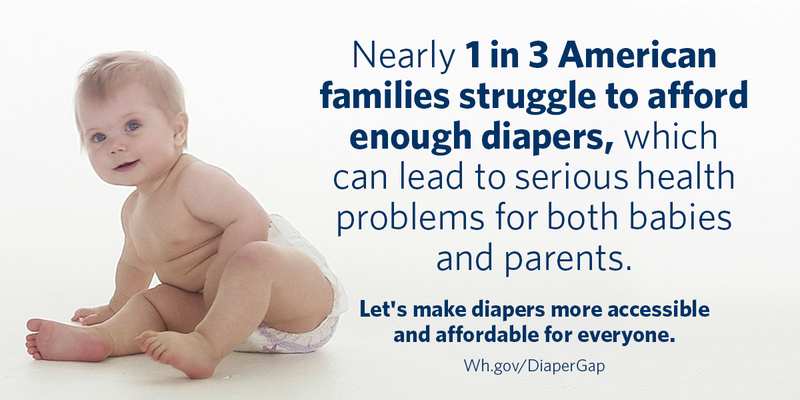 A White House article entitled The Diaper Divide, which was released today, highlights some alarming statistics about the needs of struggling families and the health consequences to infants who do not have access to enough diapers. 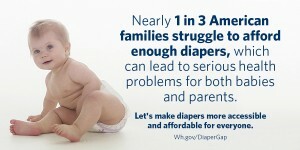 Nearly 1 in 3 families struggle to afford diapers for their babies. In some cases, moms and dads stretch the time between diaper changes to make their limited resources last. This can lead to serious health problems for babies and parents. Young children can end up hospitalized with problems like urinary tract or staph infections. Imagine the stress of not being able to afford the basics that your baby needs – not a small matter for struggling parents and caregivers. When families can’t afford a healthy number of diapers for their babies, they’re faced with a choice between buying diapers and paying for food, rent, or utilities like heat. That’s a choice that no family should have to make. In the worst case, over time these kinds of stressors can contribute to the incidence of abuse and neglect of young children. … the lowest-income quintile of families with infants pay 14 percent of their income for diapers alone. There is also no federal assistance for purchasing diapers, unlike other essentials like food or health insurance. Programs like WIC, SNAP, Medicaid help provide parents with nutritious foods and the supports they and their babies need to stay healthy … (but) we don’t have a program to help struggling families buy diapers for their children. My pastor, Philip McCoy, who is also on our board of directors, is the director of the Christian Food Bank of Hopkins County. We had been talking about the need for diapers in the last few weeks, and he shared with me earlier in the week that the Christian Food Bank was completely out of diapers. Our ministry is parterning with the Christian Food Bank to donate diapers, and we need your help! For the first $500 that is donated, we will match it from our general fund. But don’t stop there — please give generously! Your donation will help struggling families in Hopkins County provide the good hygiene their infants and toddlers need to stay happy and healthy! Please give today! All donations to our 501(c)(3) nonprofit organization are tax deductible!